Happy 2014! As always, my resolution to blog more carries into the new year. I’ve committed for every Instagram photo of food that gets posted, a blog post must go hand in hand. With work, I’ve been back and forth to Vermont a number of times and have already enjoyed plenty of cheese and maple syrup. There have been so many wonderful (and not so wonderful) places to eat in VT, however I try to keep my camera use to a minimum so as not to scare my team away. I started 2014 at home with Mr. E with a nice plate of blueberry and banana pancakes, my dad’s specialty which has really become a taste of home. What better way to start a fresh new year? ***Note: If you’re like me and never have buttermilk on hand, mix milk with plain yogurt to get that special tang. I used whole milk in the fridge, which is also nothing short of a miracle since I only drink skim. I may have ignored that the expiration date was on the day before. Whatever. It smelled ok. Then I added one of my Fage plain 2% Greek yogurts I had in the fridge since sacrificing yogurt for pancakes was a very easy decision. In a large bowl, whisk together the egg, buttermilk, milk (or milk and yogurt mixture in my case) and melted butter. Add the flour, sugar, salt, baking soda and baking powder. Most recipes call for sifting, which I find tedious and unnecessary unless you have freakishly large solids in your sugar. Mix until the flour disappears, being careful not to overbeat the batter or you’ll end up with rubber frisbees. Melt 1/2 tablespoon of the butter in a large skillet over medium heat. Cast iron is preferable but a non-stick skillet will do you fine. Ladle about 1/4 cup of batter into the pan for each pancake. 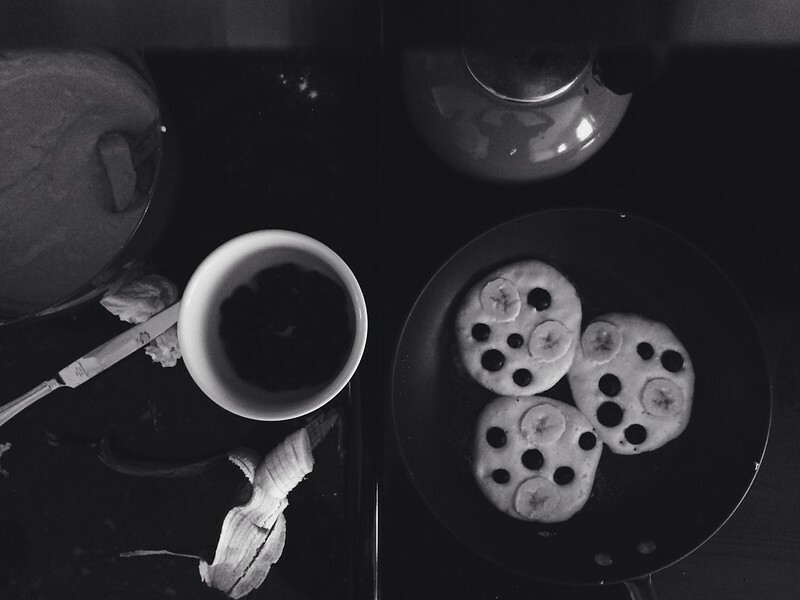 Immediately press 2 to 3 banana slices into the batter and stud with blueberries. Cook until bubbles appear and then flip and cook on the other side, about 3 minutes total. Enjoy with maple syrup. Oh hi over there in the kettle! The blueberries definitely may be the culprit there. 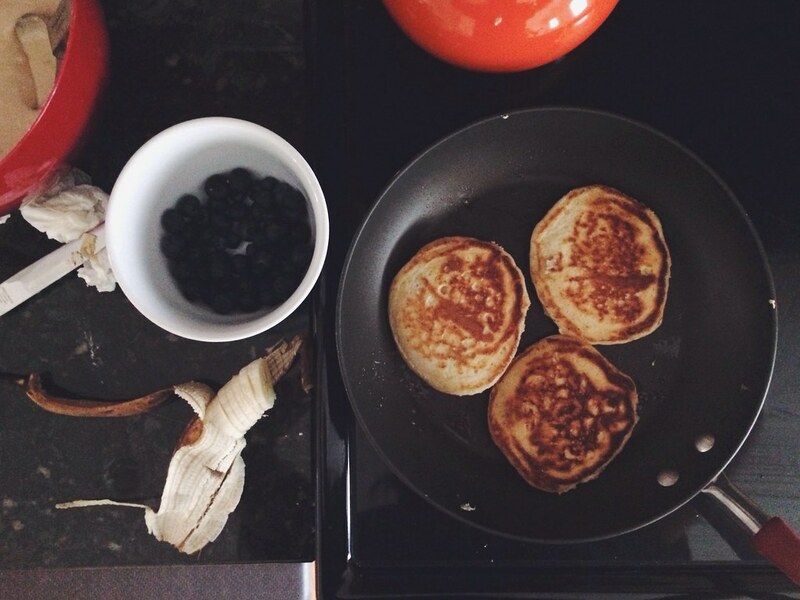 Bananas help add a lot of sweetness to the pancakes and I really like the mix of the banana and blueberries together in a pancake vs. on their own. Be on the lookout for more recipes! Thanks for reading.